The Cruise Lines International Association (CLIA) has released a travel agent survey that travelers are booking longer cruises from 14 to 100 day voyages. 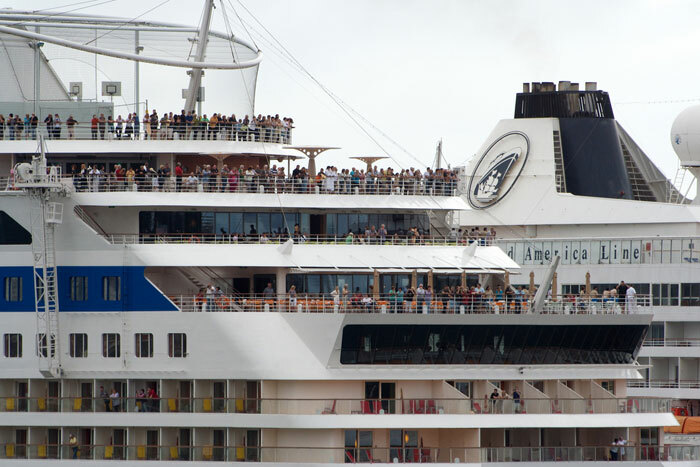 Longer sailings, including world cruises of several months, are increasingly popular among both retired and affluent travelers, according to travel agents. Agents also reported that the top advantage of long cruises is the ability to see many places hassle free, without having to deal with multiple airports and packing and unpacking. Travelers also like the exciting itineraries offered by cruise lines to places around the world that would be difficult to visit on land. Norwegian Cruise Line’s Norwegian Sun returns to South America for the first time in five years with 14-day cruises between Santiago (Valparaiso), Chile and Buenos Aires, from November 2015 through March 2016. Included is scenic cruising in the Chilean Fjords, Strait of Magellan and around Cape Horn. Carnival Cruise Line’s long itineraries include a 12-day Journey of Discovery sailing from Galveston on the Carnival Triumph, embarking March 2. The ship calls in Grand Cayman, Limon (Costa Rica) and Cartagena and Santa Marta (Colombia). In Colon, Panama, guests will have the opportunity to take an optional excursion for an up-close view of the wonders of the Panama Canal. The call at Santa Marta will mark Carnival’s first-ever visit to this beautiful seaside city. On the West Coast, the Carnival Miracle will operate three 15-day round-trip cruises from Long Beach to Hawaii, embarking October 17 and November 28, 2015, and November 16, 2016. On these sailings, guests can visit Maui, Honolulu, Kauai, Kona and Hilo, as well as Ensenada, Mexico. From Baltimore, Carnival passengers can cruise on the Carnival Pride, embarking March 13, 2016, on a 14-day eastern Caribbean cruise that visits Grand Turk,San Juan, St. Thomas, Dominica, St. Lucia, Martinique, Antigua and St. Maarten. All three Cunard ocean liners will celebrate the line’s 175th anniversary in 2015 with world cruises. The Queen Mary 2 sets sail on a 113-day voyage from Los Angeles, embarking in January, and visiting 54 ports in 29 countries including in the South Pacific, Asia, the Middle East and Europe. A unique 57-day Boomerang cruise (back by popular demand) has passengers embarking in February on the Queen Elizabeth from San Francisco and then switching ships in Australia to the Queen Victoria, with an eight-day land stay exploring deeper into the land Down Under. Princess Cruises has 10-day and longer cruises including a 40-day World Cruise Segment on the Sea Princess, embarking New York on July 25 and taking passengers to Sydney by way of the Panama Canal and South America, French Polynesia and New Zealand. Highlights will include a visit to Easter Island. Princess Cruises’ Full World Cruise on Pacific Princess will be the first time a Princess’ World Cruise will depart and return from North America. The 111-day voyage sails round-trip from Los Angeles, embarking January 23, the itinerary spanning six continents. Holland America Line’s long cruises include a 114-day Grand World Voyage on the ms Amsterdam, also available in segments. For instance, set sail in February on a 22-day sailing from Sydney to Singapore on the ms Amsterdam. Port calls give you an extended look at Australia – including Melbourne, Adelaide, Albany, Fremantle and Geraldton – as well as Bali. Central and South America get focus on a 34-day itinerary embarking March 21, 2016, on the luxurious Seabourn Odyssey. The Path of Galleons cruise, from Los Angeles to Barcelona brings guests to ports in Mexico, Guatemala, Costa Rica,Panama (including the Panama Canal and San Blas Islands) and Colombia, and also visits Fort Lauderdale and the Portuguese island of Madeira. Silversea Cruises’ World Cruise 2015 will take passengers on the elegant Silver Whisper on an epic, 115-day voyage to 30 countries and 50 ports of call. The sailing embarks January 5. Luxury line Crystal Cruises has a variety of 10-day or longer sailings on its 2015 to 2017 calendar including a 108-day Crystal Silver Celebration World Cruise on Crystal Serenity, embarking in January. Set sail with Italian line Costa Cruises on a 115-day, 40-port voyage to five continents. Cruising from Savona, Italy in January, the Costa Deliziosa will visit such “Bucket List” places as Rio de Janeiro, Tahiti,Auckland, Sydney and Cape Town. Let us know which cruises your planning for this year and if they will be long or short.